It is currently Sat Apr 20, 2019 5:11 pm. Download our recommended UO client. If you already have a UO client version 5.0 or greater you may use it to connect, we recommend client version 5.0.8.3. This is the T2A version of the client, it includes Razor and UO Auto Map. Other download locations available on our website. You *MUST* have this package installed to use Razor with Windows XP. If running under Vista or Windows 7, run this program as administrator by right clicking the shortcut, and choosing "Run as Administrator" or go to Properties -> Compatibility and check "Run this program as an administrator. ", also choose "Disable Desktop Composition" if you use Razors counters feature, so these will display in the window title bar. Press connect, enter any new unique username and password to create a new account. You may have a maximum of three accounts on Second Age. Once you have successfully created a new account (this may take a couple tries if you try to use a username that's already in use), you will see the shard selection screen. "Second Age" is the primary shard. 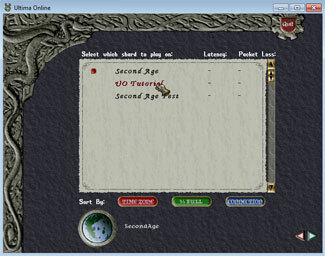 "UO Tutorial" is a online single player introduction to UO. The tutorial is highly recommended if you are new to the game. "Second Age Test" is a test center, not always available. The account you chose in the step above will be your account on all three of these shards. If you selected the tutorial, your character will be automatically created. Otherwise follow the steps indicated to create a new character. 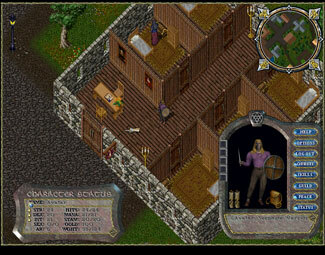 As this is an emulation of the T2A era of Ultima Online, not all template choices are available. See the beginner's guide in our Wiki http://wiki.uosecondage.com/Beginners_Guide for recommendations on creating a new character, and on getting started in the world of Britannia. Please turn off the setting "Use Smart CPU Reduction" in Razor, as this setting is not compatible with modern operating systems. Also consider selecting "Use Pre-AOS Status Window". When prompted for an email address in game, please enter one. This is how your accounts are registered, we will not send you spam or share your email with other parties. Although this is not required to play, the only way to determine ownership of an account is through this email registration and non-registered accounts will receive limited account support. Please register all your game accounts to the same email address. Last edited by Boomland Jenkins on Wed Mar 25, 2015 7:45 am, edited 34 times in total. no cd required, just download a a client, then razor, run razor, plug in server info, play. I get multiple "unable to locate ciloc" errors in Razor and then razor will crash saying the client didn't start up and a TID error. Razor is also launching the auto-patcher, should it be doing this if no updates are necessary? The client works perfectly fine. It's sitting there waiting for me to enter my Origin login. **EDIT** Apparently Razor does not work with the Kingdom Reborn client. Aye, KR isn't yet supported. You can get the legacy client from the links above, or If you can find your old T2A cd, you can install from that and patch up to 5.0.8.3, or at least to 4.0. I installed from my T2A cd, all the old graphics and music are in there. 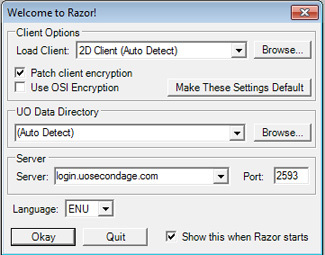 I downloaded the 15 day uo gold thing and it says im running client 4.0.6 razor and everything works fine its just when I try to type my user and pass it won't let me connect. It says couldn't connect to Ultima Online. Please try again in a few moments. Internet connection is fine I haven't made any other accounts....whats the problem? Are you typing uosecondage.com and port 2593 in the server and port boxes? 1) You enter any username and password you want. You can have a max of 3 accounts per IP. 2) There is no reactivaction. If you made 3 accounts in the past and can't remember the username/pw send a PM to Derrick and I am sure he can retrieve it for you. 3) It's 100% free. He does accept donations though to help pay for the server. What client are you running? Did you install Kingdom Reborn? Or an earlier version? This has been reported before. The solution for this appears to be patching up. 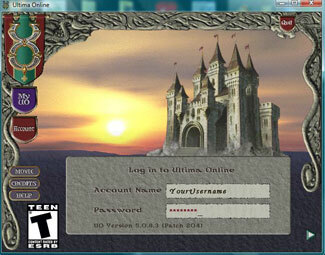 Run UOAutoPatch in your Ultima Online folder and patch until 5.0.8.3 or so. Then you're ready to stop patching (Better not to go all the way up) Click the Cancel button during download. If you don't have to patch all the way to 5.0.8.3 you should be able to play with not much patching. You can't log in by modifying the login.cfg because of the encrypted client packets. You'll need to download Razor to connect. Check step two and three at the top of this thread (need .Net framework for Razor). Looking forward to seeing you in game!